Time for this week's CAS(E) This Sketch, this time by Jackie Rockwell. We have a new DT member this week - the super-talented Donna Mikasa! Welcome Donna! I turned the sketch on its side to create this graphic Christmas card in classic colours, using Memory Box Parker Upper Case letters. The red mirror card looks almost liquid in this photo, doesn't it? Now it's your turn. Don't forget to link up before the deadline next Tuesday at noon! 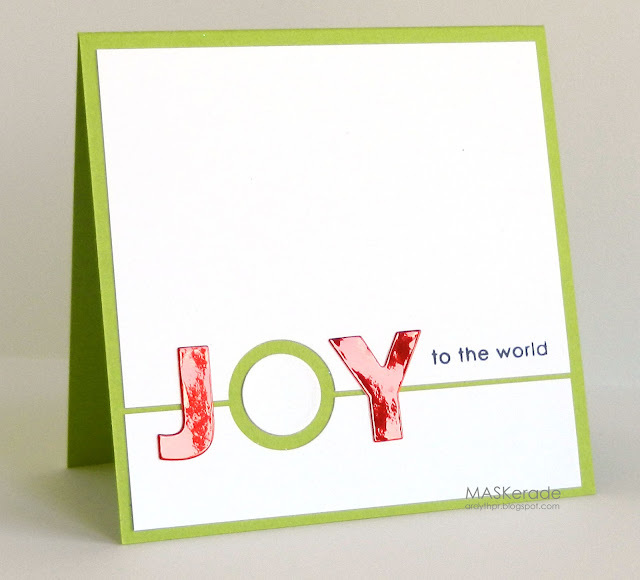 Gloriously clean & simple - brought 'joy' to my heart! Wow, I also thought you'd been at the UTEE or something. Those red letters are fab and make the whole card so vibrant. So that's shine I see. I thought it was a "candy cane like" paper. I love the way you put it all together with the green circle and line. Love the shine on those letters, Ardyth! Such a cool graphic design. Those glossy letters look fabulous on this CAS beauty! NJ! Very cool take on the sketch. Love the glossy letters. Oh, but your 'O' is divine, such a clever use of negative space, LoVe it! The shiny lettering is fab but how cool is that 'O' !!! A true Ardyth card - LOVE it! You are just one of the most creative people out there! Love this! I love how the O ties into the background and layout of the card. The shine is AWESOME! Brilliant design. I'm in love with that O!